ePublishing Knowledge BaseePublishing Knowledge BaseePublishing Knowledge Base Creating, Managing, and Selling Products How do I manage store orders? The ePublishing Order Manager allows you to review product purchases and may act as a rudimentary order fulfillment system. This article will show you how to view and manage orders through ePublishing. 1. 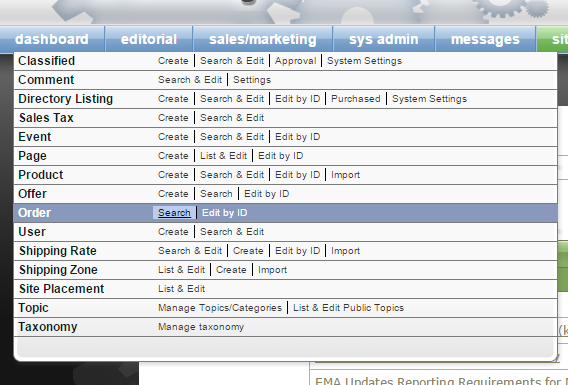 Access the Order Manager by clicking Search next to Order under Sales/Marketing on your dashboard. 2. If you are searching for a specific product or user, search by order ID, offer codes, product name/ID, or the purchaser's email address. Zoom: If you are searching for a specific product or user, search by order ID, offer codes, product name/ID, or the purchaser's email address. If you'd like to view all orders, simply click Search without entering any search terms first. You may also set a date range for the orders you'd like to view. 3. To export all orders from your search results, check the box next to Export all Results (circled) and click the preferred method below. Zoom: To export all orders from your search results, check the box next to Export all Results (circled) and click the preferred method below. Or select the orders in your search results you'd like to export and check the box next to Export selected orders only. 4. To view details of a specific order, click View. Zoom: To view details of a specific order, click View. Search results will show the Order ID, User, the total spent, offer codes used, when the order was placed and the status of the order. 5. After clicking View, you will see the following details of the order. 6. To track fulfillment, select the appropriate status of the order on the dropdown. Zoom: To track fulfillment, select the appropriate status of the order on the dropdown. 7. 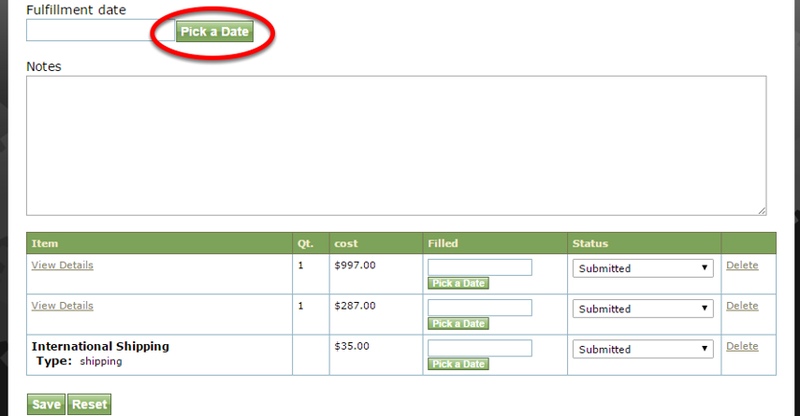 If you are tracking fulfillment, select a Fulfillment date by clicking Pick a Date and add notes. Zoom: If you are tracking fulfillment, select a Fulfillment date by clicking Pick a Date and add notes. 8. To view the details of each item ordered, click View Details. Zoom: To view the details of each item ordered, click View Details. You may also track fulfillment here. Click Pick a Date to select when that individual item was fulfillled and track the status of individual items. 9. If you've made any changes, click Save. Prev: How do I access store orders? Next: How do I change the “Thank You” messages that appear on my website's order confirmation page?